Have you ever wondered how art gets into the public space? There are plenty who wonder why, but that’s a whole other answer. 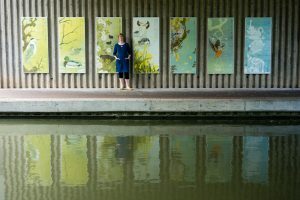 This is the tale of my public art project to install seven enamel panels, depicting local birds and plants, at the side of the Grand Union Canal in Milton Keynes as one of seven artists commissioned to provide art for the Gyosei Arts Trail. It’s a slow old process public art. It may seem that all you need is Anish Kapoor on speed dial and bish, bash, bosh you have big art on the doorstep, but the reality is much more glacial. The Gyosei Trail (named in commemoration of the Gyosei International School, previous occupant of the site) first cropped up with an invitation to me from Great Linford Parish Council to suggest ideas back in 2012. These days I only pitch for public art by invitation, which sounds awfully smart, but in reality just means I do it very rarely, have a bit of a niche with large-scale enamel work and a decent reputation for turning up sober and on budget. I love coming up with ideas for public art. Printmakers by sheer force of their processes tend to the practical and it is the cocktail of artistic vision spiked by questions of production, installation and, everyone’s favourite, vandalism that I enjoy. 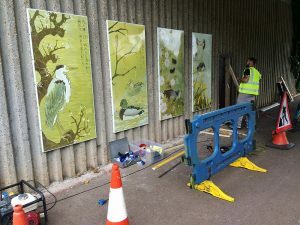 For this project I had the Japanese legacy, the slip-slop of canal water and local birdlife to inspire me, balanced with working out how to get full colour images plus Japanese poems onto enamel, then onto the side of a bridge and then keep them there safely. A quick word about the money and my budget planning methods. The original funding came from the builders of the new housing development on site under compulsory government directive 106 (the money funded improvement to the area’s transport, educational and leisure facilities in addition to our arts trail). Coming up with the artwork is never as stressful as coming up with the budget. Once my pitch was accepted, I had to create a proposal with an upfront budget including everything from my time to the high-vis vests worn at installation since the financial contract was finalised on my predicted budget. Here’s where a good imagination comes in useful: I sat and visualised the entire project from sketchbook to bridge wall, simply writing down everything I could see to give me a framework. Then I researched and costed practical issues like labour, production, delivery expenses, health and safety and site access to fill in the blanks. Possibly not everyone’s way of arriving at the budget, but it works. Here’s an example of one of my design drawings for the project. This is what my client saw initially and was good enough to pay for up front (many projects die in the water and not all clients are as ethical about paying artists for work done when this happens). The choice of format is that mix of aesthetic/practical I mentioned: the viewer sees a pleasing nod to the Japanese love of the tall upright scroll painting, while in fact the factory could only print to 84cm wide so I simply had to go up rather than out. As for subject matter, check and then check again: my progressive seasonal theme needed both birds and plants in accurate as well as aesthetic accord. That or I’d be called to account by knowledgeable locals and have to announce that the whole project was a subversive look at the impact of global warming – wildly inaccurate to wildlife activist in one bound. The poems too were tricky. The client kindly researched and supplied seven appropriate poems, but it was up to me to get them correctly typeset and into place. My family came up trumps and coerced a Japanese scholar, under the impression she was staying with friends for a holiday, into proof reading and, unable to resist the weight of her learning, into providing authors for poems thought to be anonymous. I always tend towards hand painting my enamel projects, but my discovery of Tiled Space, a company that can print enamel as a transfer to simply slide onto metal for firing, meant I could provide a more complex design incorporating text at the same time within budget. These are the originals. I chose linocut over Japanese woodblock for its stronger, more graphic quality and because I wanted to sneak in something of the British transport poster. Colour I always make up as I go along. I spent almost as much time as the local fishermen looking at the canal and working out how to say ripple seven times without repeating myself while mixing seven believable but somewhat more upbeat than usual canal water themes. Printing the enamel was up to Tiled Space. We had some hiccoughs along the way as can only be expected when the factory is pushing brand new technology to the very edge of its tolerance, but the day came when we had seven enamels ready in our back garden. Heaving them from garden and onto bridge wall I subcontracted to my more than capable other half, plus fellow printmaker and strong man Will. The enamels sit on the support wall of a large bridge. As you can see from the photo, the bridge wall is corrugated and if you’ve ever watched a toddler try to stick dry pasta to corrugated cardboard*, you’ll appreciate attaching the enamel panels didn’t come easy. Ben and Will had to drill eighty odd entirely accurate holes into the unknown, untried concrete to hang a series of stainless steel frames. Then they hefted each panel into place to be fixed with tamper proof security screws while hoping Islebest, another of my factory finds and fabricators of the frames, hadn’t let us down in drilling exactly matching pilot holes to twin with the enamels. They hadn’t and everything aligned perfectly, falling into place. Thus I was able to accept kind comments from passers-by with gracious modesty when I arrived later to swan about and have my photo taken for publicity and blogs such as this. You can see my enamels on the canal as it passes under under Dansteed Way, Milton Keynes and don’t forget you can buy greeting cards of the birds in my shop or treat yourself to an original linocut from the project. Thank you for this. The panels are very impressive. I had wondered how much of the planning and logistics would be the artist’s hands, and it sounds like it’s just about the whole lot. Congratulations Laura, these look utterly stunning. 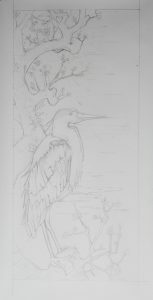 So excited to see this and read your blog as I am the proud owner of one of the original herons. I live abroad, but hope to visit these at some point…….